Bolivian Cholitas’ wrestlers impact Milan Fashion Week! MILAN — Milan designers are breathing fresh air into Milan Fashion Week, quite literally. Many fashion houses are showing their collections outdoors this season, or at least throwing open the windows on their grand palazzi venues, betting on Mother Nature with open-air shows. The late summer-early fall weather has cooperated fully. 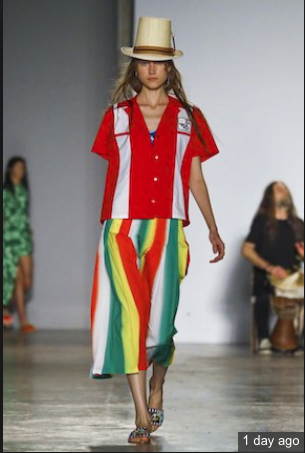 The fierce Cholitas Luchadoras female wresters of Bolivia inspired Italian-Haitian designer Stella Jean’s latest collection, which combines elements of the Cholitas traditional costume with Western tailoring and sportswear. Jean said she was impressed by the way the Cholitas, who were spurned for their traditional colorful dresses, defied the discrimination by becoming professional wrestlers. 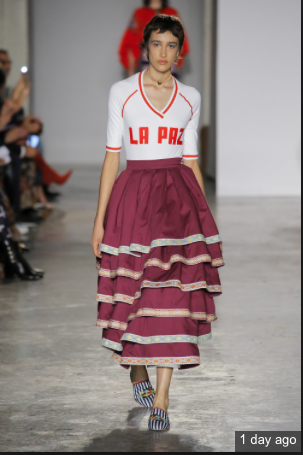 Jean’s Cholitas wear white peasant dresses with embroidery details layered with bowling shirts, or full skirts and men’s shirts with a wrestler’s body overtop. Wrestling capes were emblazoned with “Stella Jean Wrestling Team,” and the looks were finished with tall Peruvian hats. Bolivian Thoughts opinion: Kudos to our Cholitas wrestlers who have transcended our borders and now became part of world fashion! About the pics shown here, I obtained them in the internet. This entry was posted in Bolivia and tagged Bolivian fashion, competitiveness, women's wrestling. Bookmark the permalink.